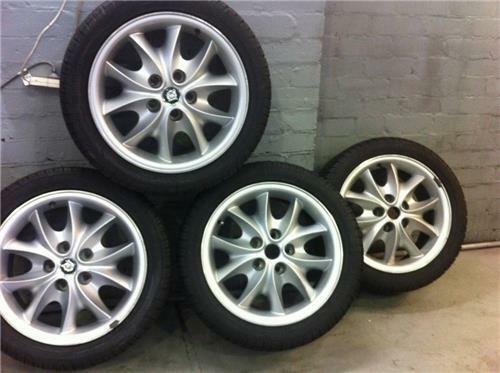 Up for Sale is a set JAGUAR X308 SPORT 17" wheel & Pirelli tyres - Upgrade your V8 or replace your Metric tyres. These wheels are off an X308 (1999) & are 17" diameter fitted with 266/40/17 Pirelli Tyres. If you are replacing your XJ40 metric tyres these rims are a better replacement (rather than paying $595 a tyre, if you can get them) & closer in diameter than putting on a set of 15" wheels. Please note that the caps are not included, but the black rimmed Growler off the earlier models will fit. (We can supply the chrome rimmed newer style badges at extra cost if requires). They also are a great upgrade for any X300 or X308 & will look good on any model.These wheels will enhance any earlier model vehicle that they are fitted to, even a X300 when they are fitted with a steel rim with a plastic dress rim. Buyer to contact me within 24 hours to make arrangements for pickup & we are happy to help with delivery at Buyers cost.